New Year's "Frolic" Invitation from the collections of the Worthington Historical Society (WHS) may be used for educational purposes as long as it is not altered in any way and proper credit is given: "Courtesy of the Worthington Historical Society, Worthington, OH." Prior written permission of the WHS is required for any other use of New Year's "Frolic" Invitation. Contact WHS at info@worthingtonhistory.org to request permission. New Year's "Frolic" Invitation is text. Its dimensions are 2.35 in. x 3.36 in.. It was created in 1817. 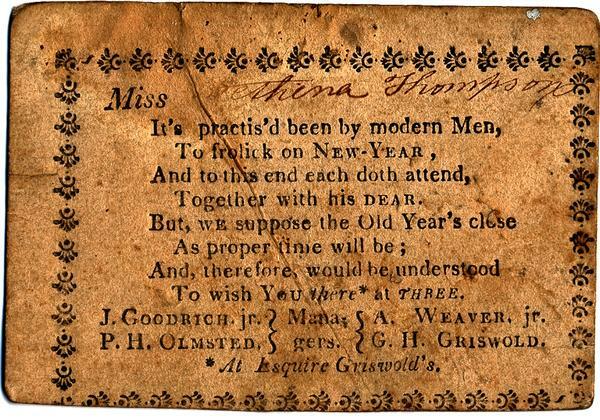 This is an invitation addressed to Bethena Thompson for a New Year's "frolic" at Esquire Griswold's. Managers of the event are identified as John Goodrich, George Harlow Griswold, Philo Olmstead, and Asa Weaver. It covers the topic balls (dance parties). The Worthington Historical Society identification code is 55-L-182E (box Ephemera - Invitations). The Worthington Memory identification code is whs0804. This metadata record was human prepared by Worthington Libraries on October 27, 2005. It was last updated November 13, 2017. The big New Year's bash heralding 2018 may be over, but the party lives on in Worthington Memory! Our January exhibit looks back at New Years from centuries and decades past.